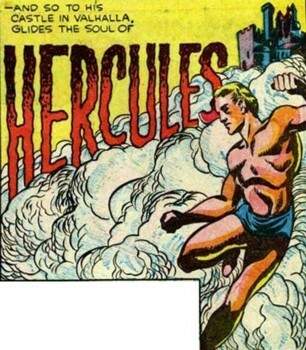 Powers/Abilities: As his body was the vessel for the reincarnated soul of "Hercules," Marvel Boy was strong enough to lift 7 tons, and he could run at least 100 miles per hour. (Daring Mystery Comics#6/1 (fb) ) - Centuries ago, when a hero called "Hercules" died, his soul ascended to the mystic realm of "Valhalla". But in 1926, "Hercules" foresaw the rise to power of Adolf Hitler (see comments). With the approval of "Jupiter," the spirit of "Hercules" returned to Earth to share the body of the newborn Martin Simon Burns. Even in his early months, the infant Martin's strength alarmed his parents, for he was constantly breaking milk bottles. The years went by, and the baby grew older and stronger -- as a boy, Martin avoided playing with other children, for fear of inadvertently injuring them. 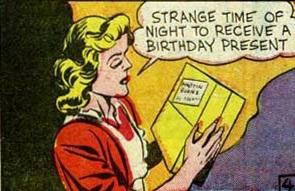 (Daring Mystery Comics#6/1) - One stormy evening in 1940, on the night of Martin's 14th birthday, a mysterious messenger delivered a package for him at the door of the Burns' home; Martin's mother took the package and left it in her sleeping son's bedroom. 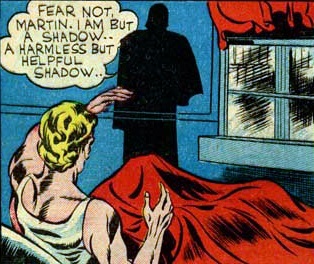 Martin was awakened by a silhouetted figure who identified himself as "a harmless but helpful shadow". The shadow revealed Martin's connection to "Hercules" and told the boy that it was his destiny to protect America from "men who hold power over millions". 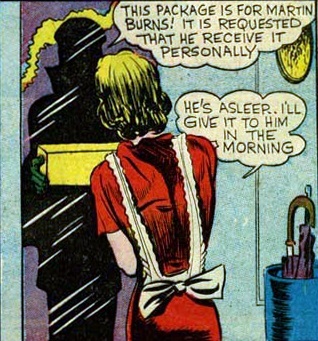 The shadow dubbed Martin as "the Marvel Boy" and bid him to open the package, which contained a costume; Martin donned the costume, and the shadow told him of a Nazi plot involving the smuggling of operatives into America for an upcoming invasion. Marvel Boy raced to an obscure little inland cove on the Hudson River, where a German U-boat had just dropped off four Nazi operatives; the U-boat headed out to sea and the spies climbed aboard a truck so they could be taken to various parts of the country. As the speeding truck drove down the road, Marvel Boy dashed for the cab and confronted the driver and his armed partner, forcing the truck to stop. 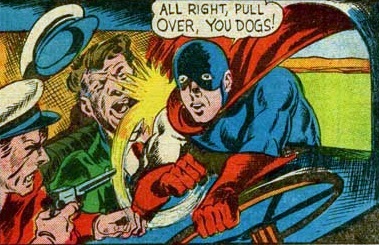 Hearing gunfire, the four spies climbed out of the back of the truck and opened fire, killing the two men in the cab, but missing the nimble Marvel Boy. The young hero tackled the four spies and bound them all together with a length of rope. 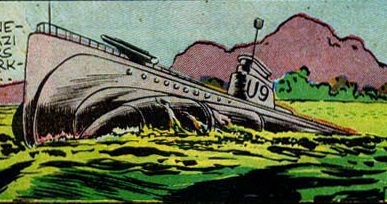 After searching one of the spies and finding papers with their official orders, Marvel Boy carried them all to FBI headquarters in Washington, D.C.
Marvel Boy next confronted the spy ring's leaders -- Broen, Shultz, and Stohl -- and forced them to radio the U-boat to change its course -- the submarine was tricked into going to the Navy shipyard, where the vessel was impounded and its crew was arrested. Marvel Boy then telephoned the local FBI headquarters to have the three ring leaders taken into custody. With his task completed, Marvel Boy went home and stealthily returned to his bedroom to catch a well deserved bit of sleep. The next morning, Martin arrived late for school -- unaware of his heroic deed the night before, Martin's teacher scornfully told him that she was relieved that the country didn't have to depend on boys like him to protect the nation's shores. Comments: Created by Joe Simon (writer) and Jack Kirby (artist). Marvel Boy has a profile in All-New Official Handbook of the Marvel Universe A to Z: Update#4, from which I got some of this profile's information (e.g. 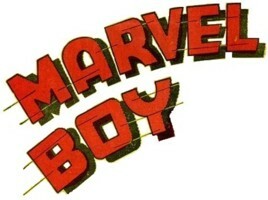 Marvel Boy's physical characteristics, mother's names, etc.). 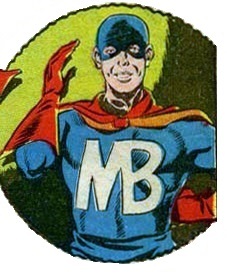 And although the blurb in the last panel promised another Marvel Boy adventure in the next issue, this would be the character's only appearance. However, this character would be reworked a couple years later as another Marvel Boy (@ U.S.A. Comics I#7/3 (February, 1943) ) who was also named "Martin Burns"; but these two Marvel Boys are distinct individuals, and they are distinguished by their middle names, which were taken from their respective creators (The later-introduced Marvel Boy has the middle name of "Oksner," after his creator, Bob Oksner). Maybe "Hercules" was actually "Hercules Jr.", an unknown son that the actual Hercules fathered in ancient times during one of his dalliances with a mortal woman -- being the offspring of a human mother and a demigod father, it would mean that "Hercules Jr." was 75% human, and thus not immortal nor nearly as strong as his father. 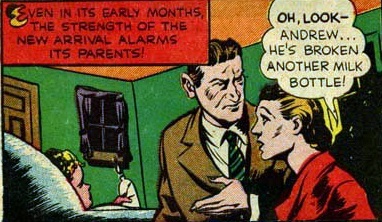 And going by that assumption, perhaps the earthly remains of "Hercules Jr." were placed in that mummy case that would eventually topple upon Martin Oksner Burns and endow him with superhuman strength. 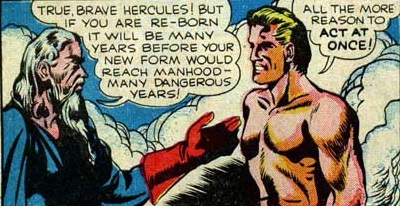 Both Marvel Boys had a connection to "Hercules,"and the Young Avenger (like the two Marvel Boys) also had a mysterious shadowy figure who instructed him to perform heroic deeds -- perhaps there was some connection between these three young heroes. Since they're all essentially the same character, maybe they could be teamed-up in a new series: The Young Avenging Marvel Boys. Although the bad guys in this story were identified as Nazis, on page 7, panel 2 Shultz and the U-boat captain greet each other and both say "Heil HILLER" -- my guess is that it probably wasn't a misspelling, but since the U.S. had not officially declared war with Germany at the time of publication of the story, Timely Comics may not have wanted to disrespect another country's head-of-state (...even if he was a paranoid and psychotic madman). 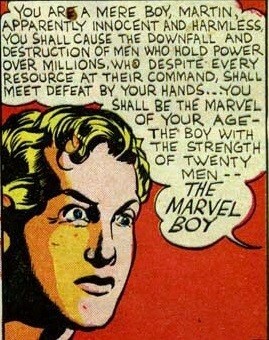 Marvel Boy could be an Eternal. 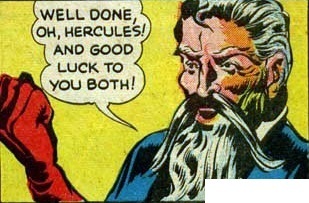 Both his and Mercury/Makkari's Jupiter (Red Raven Comics#1 (August, 1940); Mercury) have white hair and beards and Mercury's Jupiter has been identified as the Eternal Zuras. Plus in Avengers I#308 (October, 1989) Sprite altered the cloak around Olympia to transport it to the Negative Zone, so it would make sense that during WW2 the Eternals would move Olympia to another dimension (Valhalla) to avoid Allied/Axis soldiers from wandering into the city. As for "Hercules", the Eternals could have transferred his consciousness into a computer like Machinesmith's was in Captain America I#249 (September, 1980) and a hologram could explain his soul/spirit talking to Jupiter before he is implanted in a clone body. The father and mother of Martin Simon Burns, they were concerned by their infant son's unusual display of strength -- they were unaware that their newborn son shared his body with the reincarnated spirit of "Hercules". 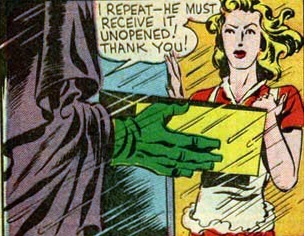 On the night of Martin's 14th birthday, Barbara accepted delivery of a package for Martin that was brought to their door by a mysterious messenger. Barbara then left the package in her sleeping son's bedroom. 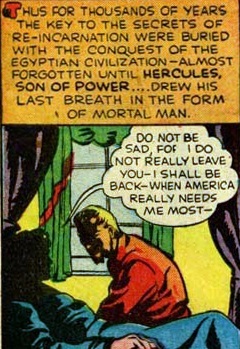 A legendary hero of ancient times, when "Hercules" (Son of Power) died, he vowed on his deathbed that he would return when America needed him most. The spirit of "Hercules" ascended to his castle in the mystic realm of "Valhalla". 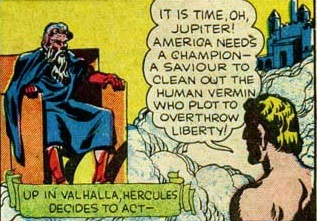 In 1926, "Hercules" foresaw the rise of the Nazis in Germany; realizing that America would need a savior to protect liberty, "Hercules" went to "Jupiter" and got his approval to return to Earth. The soul of "Hercules" descended to the heart of a crowded metropolis, where the champion was reborn in the body of infant Martin Simon Burns. Apparently the ruler of the mystic realm of "Valhalla," he gave his approval when "Hercules" requested to return to Earth in 1926. But "Jupiter" advised "Hercules" that if he returned to the mortal plane, it would be as a newborn, and it would be many years before his new form reached manhood. One dark and stormy night, the unidentified silhouette delivered a package containing a costume to the home of Martin Simon Burns. The shadow gave the package to Martin's mother, then walked off into the stormy darkness. Martin's mother carried the package to her sleeping son's bedroom. Shortly afterward, the shadow appeared in Martin's bedroom and informed the boy that his body held the soul of the reincarnated "Hercules". 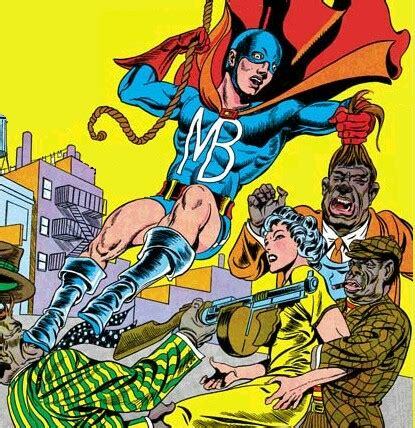 The shadow dubbed Martin as "the Marvel Boy" and bid him to don the costume in the package. The shadow warned Martin about Nazi agents who were secretly filtering into the country, and tasked him to strike a blow against the fifth columnists. In 1940, the Third Reich set up an espionage network in preparation for a proposed invasion of America by Nazi forces. A U-boat (the crew of which included Richter and Strohm) transported spies to an inland cove on the Hudson River; the spies would then board a truck and were driven to various parts of the country to secretly infiltrate American society and mingle freely, learning as much as they could until the day of the invasion arrived. The spy network was headed by Friedrich Broen, Gustav Shultz, and Frank Stohl, and the three coordinated the smuggling efforts for the Nazi infiltrators. The U-boat had just dropped off the latest batch of spies (three men and one woman), and as the four agents were being transported by truck, Marvel Boy (Martin Simon Burns) raced into action. The young hero captured the four spies and carried them all to FBI headquarters in Washington, D.C.
Marvel Boy confronted the three spy ring leaders, forcing Shultz to radio the U-boat and change its course to the Navy shipyard, where the submarine would be captured. 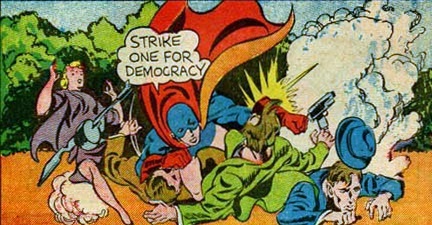 Marvel Boy then telephoned the local FBI office to have Broen, Shultz, and Stohl taken into custody.